In their commentary regarding human trafficking ("Transportation officials have a role in human trafficking battle," June 7), the authors stated the "Maryland State Police should reach out to transportation authorities to include them in ongoing training conferences and coordination." Please be assured the Maryland State Police is already doing that and much more to combat human trafficking in our state. A Laurel man is being held without bail after officials allege he assaulted and drugged a teen, then forced her into prostitution in Jessup. JESSUP, MD — Officials say two people have been charged with human trafficking of a minor in Howard County. Police received a tip on May 31 that a man was offering a teen for money at Jessup area motels. Andre Lamar Russell, 28, of Dulwick Court in Laurel, and Heather Lynn Harding, 23, of Woodbine Roadin Woodbine, were charged with human trafficking of a minor. Nearly three years ago, in a Howard County General Hospital waiting room sit a human trafficking victim with her trafficker to get a prescription for insulin. Rowland Duffey, the victim’s trafficker, promised a romantic relationship to lure the 21-year-old victim. The young victim had just lost her father and thought her trafficker “seemed like a nice guy.” After falling asleep watching a movie with Duffey in a van, the victim woke up in an unfamiliar hotel, according to court records. Duffey took her mobile phone and gave her a prepaid version, while demanding her to “answer anytime” he called. She was trafficked along the East Coast and in Columbia, court records show. Duffey was eventually charged and found guilty of human trafficking. A Maryland couple is facing human trafficking and child abuse charges after authorities have accused them of injecting a 15-year-old girl with heroin and forcing her into prostitution. PEOPLE obtained a statement from the Caroline County Sheriff’s Office, which confirms Darlene Louise Allen, 35, of Federalsburg, and Paul Thomas Owen, 26, of Greensboro, were arrested on April 4. One by one, they were plucked off the street, and their captors would plunge them, against their will, into the sordid business of prostitution. 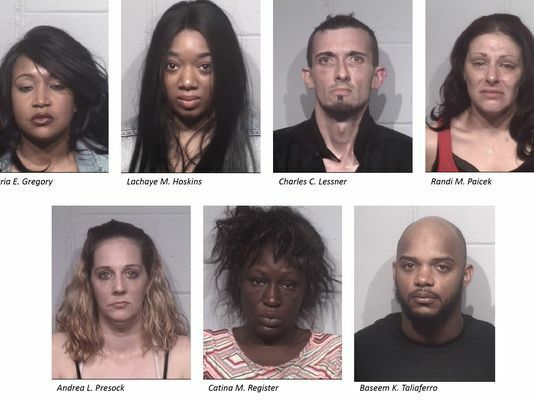 The human-trafficking ring's leaders would dress them in lingerie and take their photographs inside rooms at a Salisbury hotel barely three blocks away from a Maryland State Police barrack. The pictures were immediately posted to the internet, advertising the women to would-be johns under pseudonyms such as "Sugar" and "Sunshine."